Telstra hasn’t wasted time in announcing its integrated eSIM technology, with the news coming just hours after Apple launched the LTE-capable Apple Watch 3, the Cupertino-based firm’s first eSIM-supported smartwatch. The Aussie telco’s aptly named Telstra One Number eSIM will enable customers to share the same number and mobile data plan across their wearable and smartphone, allowing customers to take calls and texts directly on their smartwatches. This should make managing gadgets easier than having separate SIM cards for all of your devices. eSIMs are tiny, non-removable SIM cards – much smaller than a regular nano-SIM – that will connect the wearable and the handset to Telstra’s mobile network. 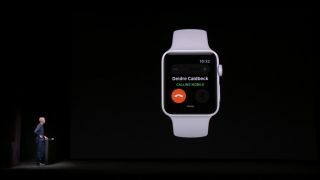 Once connected to the network, customers need not worry about leaving their phones at home for the day, with their smartwatches giving them call, text and app support. Telstra hasn’t released any pricing information yet, but has confirmed that it will be made available across various devices, with companies like Apple, Huawei, Sony, LG, Microsoft and Samsung supporting the technology. It will, however, be made available to postpaid customers first, with no mention of a timeline. Telstra is not alone – Optus, too, could bring eSIM technology to Australia, having first discussed it in a blog post from early May. We'll let you know as soon as Vodafone joins the bandwagon as well. Best 4G network in Australia: Telstra vs Optus vs Vodafone.